This rare model of a boy holding a peach is distinguished by the size of the head and the adult-like face. Despite the face, his garb is definitely of a type reserved for children, so the exposure of his genitalia would not raise eyebrows in most parts of the world. 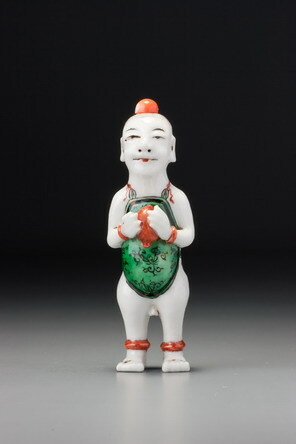 The colours are drawn from the famille verte palette, and the overall feeling of the child is somewhat similar to a group of well-known pairs of boys made in large quantities during the Kangxi period, mostly, it seems, for export to Europe. 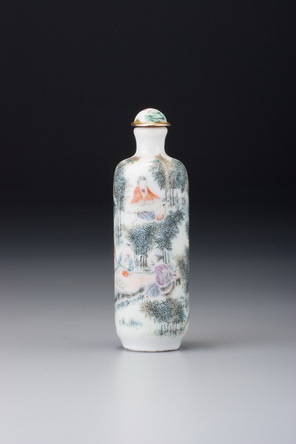 If such figures were the inspiration for this bottle, it is a good rationale for the use of the traditional palette. The use of a very thin wash of aubergine to depict the shaven head is both unusual and remarkably effective. The enamel is so diluted that the individual grains of finely ground glass can be seen in a wash of palest purple, making for an ideal depiction of stubbly hair. The fact that the interior is unglazed may be an indication that it is from the earlier end of the dating range we suggest. Whenever it was made, it is a striking model dramatized by the restrained use of a limited palette of bold colours. A similar bottle was offered at auction in the U.S. in 1921 (Glickman 2006, p. 10, fig. 1.19); other related bottles are in Hall 1996, no. 3, JICSBS, Winter 1985, p. 25, and JICSBS, Autumn 1998, p. 1, although none is from the same mould.